Follow the podcast on Twitter. If you use twitter, go to https://twitter.com/theotherccm and follow the show on twitter. Like the podcast page on Facebook. If you use Facebook, head over to https://www.facebook.com/crowdfundingchristianmusic and like the page. Follow the podcast on Google +. If you use Google Plus, head over to https://plus.google.com/+Crowdfundingchristianmusic/posts and follow the page. Interact with the podcast website. Leave comments on the posts, give feeback through the submission form. re-share the posts through your social media networks. Share the podcast with any friends or groups that you think might be interested. If you have an iTunes account: Please subscribe/download/rate/review the podcast in iTunes! Higher subscription and download numbers as well as good ratings and reviews increase the likelihood that it will hit the New and Noteworthy section and provide more visibility to random strangers discovering the Podcast. (Note: It’s also available on Stitcher and other podcast directories- if that’s more your style, please find it there, subscribe, rate/review if they offer that). 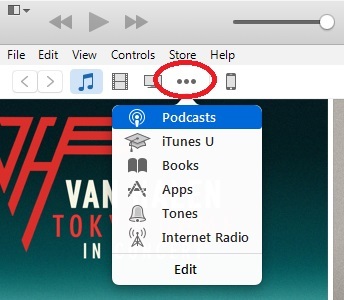 At the top left, click the three little dots to expand the menu and choose Podcasts. At the center, verify iTunes Store is selected, or select it. 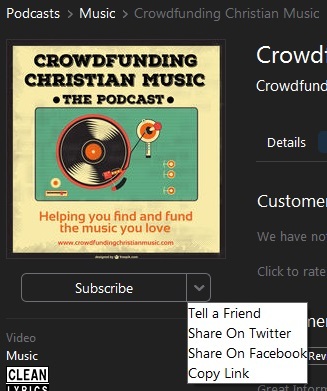 Then, in the search box (top right), search for crowdfunding christian music or click the appropriate links below. Click on the video podcast from the results or click the link above. Click Subscribe and confirm if prompted. Then download all the episodes by clicking Get. (Note that this is rather big and you should not do this on a cell data plan). At the top/center, click My Podcasts and select the video podcast. Watch some episodes that you downloaded. At the top/center, click on the iTunes Store. It should still be on the video podcast page. Click on the Ratings and Reviews tab. Write out a well thought-out review and give it an honest rating (scale 1-5 stars). Click the small drop-down to the right of Subscribe and consider telling a friend about the podcast or sharing it on Facebook or Twitter. Click the back arrow in the top left corner to go back to the search results and click on the audio podcast or click the link above. Click Subscribe and confirm if prompted. Then download all the episodes by clicking Get. Listen to some episodes that you downloaded. At the top/center, click on the iTunes Store. It should still be on the audio podcast page. Click on the Ratings and Reviews tab.